Posted March 12, 2007 by William Martin & filed under Exclusives. Since 2001, stuntman Adam Kirley has worked on the likes of Batman Begins, Die Another Day, Stormbreaker, Tomb Raider and The Mummy Returns. What advice would you give to anyone who wants to become a stuntman? What made you want to become a stuntman? Have you ever been injured as a result of your job? Has there ever been a stunt you’ve asked to do which you’ve had doubts about or refused to do? What’s your favourite type of stunt do to? Which stunt that you’ve done are you most proud of? “I’ve got a Top Three which changes all the time, but the main one has to be crashing the Aston Martin at 80mph in Casino Royale. “To get the Guinness World Record, and then to be nominated for the World Stunt Awards too… we’re going to LA in May, representing the UK! We’re up for Best High Work, for the crane jump at the start, and Best Work With A Vehicle. To be a stuntman for a Bond movie was just beyond my dreams. The free-running chase at the start of Casino Royale is now regarded by fans as one of the best action sequences in Bond movie history, how long were you working in that? 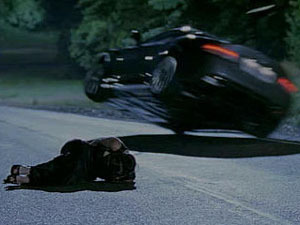 How many Aston Martins were smashed doing the crash in Casino Royale? “We crashed three or four I think. And there were two BMWs that we tested on. The Aston Martin is such a work of art, it’s like the ultimate car, so yeah, part of you doesn’t want to smash it, it just looks amazing! But then, you can’t help but have a little smile, thinking you’ve got permission to crash a £200,000 car! How’s your driving when you’re not working? What was it like working with director Christopher Nolan on Batman Begins? > Order the 50th Anniversary Blu-ray boxset on Amazon, containing all 22 James Bond films. James Bond’s stunts leave a legacy in cinema. However, so does his love for the casino, including the classic poker game with Le Chiffre in Casino Royale. Poker is about a calm nerve and an even calmer exterior, and 007 certainly has that. If you fancy trying out your poker face, there are many gaming websites for you to learn your trade. Not all allow you to play the huge variety of casino games Lucky Nugget offers though. Not only are there competetive poker tables, but there are over 450 slot machines and a variety of other table games such as Blackjack or Roulette for you to try.